If you haven't been yet, seek out the new Artomatic show in Crystal City, Virginia. It's overflowing with this areas local artists. 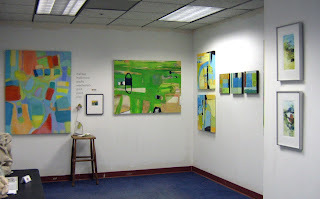 Here's a shot of my exhibition space (shared with fellow artist Paula Wachsstock). Both of our work is scattered throughout the walls in room 6C02 in the red section on the 6th floor. I've continued to receive great feedback based on the review Ellyn Weiss wrote. Here's the link to the review. Here's a diptych painting I worked on this morning. Each canvas is 40"x 57". I like working on two at a time so that I'm not tempted to put everything and the kitchen sink into one piece. For some reason I find it easier to keep moving and make decisions when I know there's a lot of canvas to cover and more that one shot at it. No undo command in this process. I think these painting are almost finished - hard to tell for certain until they're stretched and hung. 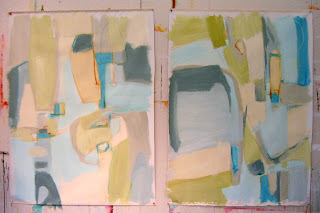 I hope to have them completed in time for my solo show in June at the Spectrum gallery in Rosslyn, Virginia. More to come on the painting and the show. Artomatic opened last Friday night. I was lucky enough to attend the opening with my husband and parents and ran into lots of friends and fellow artists. Thank you for coming. It was a packed event with more art that you could soak in one evening, drinks and live music. It's open until May 20th. Check it out!!! ColorField Remix, a series of events and exhibits celebrating color field painting and the Washington Color School, kicks off this month at venues across the metropolitan area, and Artomatic has joined in the fun and selected it's own artists who have captured that spirit to be the Washington Color School Remix tour. The group of 13 artists was selected by artist - curator Ellyn Weiss and I made the list. Now if you don't know Ellyn's work please click on the link and take a peek, this woman adores color like I do. I just can't get enough. To be selected by her is a thrill. My work is on the 6th floor in space Red 6C02. See the front reception for more information on Ellyn's color remix picks and a map of the artwork. Last Thursday I attended the opening for the Mid Atlantic hand pulled print show at the Ellipse center in Arlington. As they announced awards for the exhibit I found out this piece was selected and purchased by the Cultural Affairs division of Arlington County. What a surprise! I spotted the little red dot immediately but was thrilled to find it will hang in a public space for many to see and enjoy! I created this piece last summer while studying at Penland School of Art and Craft in North Carolina. 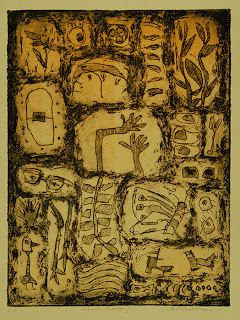 It's and etching titled Saturday morning. Here's a peek at the book I finished last weekend and my proud display of the finished product with the guru himself Dan Essig. He is quite the master of book arts. While I've been focused more on painting the last few months, I have always loved book arts. It's a sketchbooks best friend you know. It's a form of functional sculpture. To make one requires a blend of creativity, craftsmanship, attention to detail, and a willingness to rip it out as needed. (kinda like knitting?!??!) I love the paper, have I mentioned I love the paper? It gives me a good reason to get more, I mean use some of the heaping stash that I already have. I love the endless combinations of thread, wood, paper and alternative materials. I see it as a well dressed man - great suit, great tie, great shirt, shoes, belt you get the point - every detail adds to the overall impression. 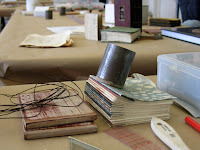 This week my Corcoran sketchbook class will get started on it's first book. Here's my final four. Wonder which one will get filled first? 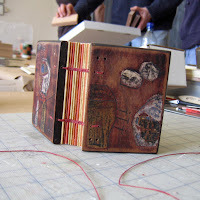 I spent the weekend studying bookmaking with Daniel Essig. Over the course of three days we worked on two book forms that are variations of the ethiopian coptic stitch. We worked with papyrus, cotton papers, fossils, waxed linen thread, bone folders, rules, exacto knives, metal squares, PVA glue, needles, wood, hand drills, a drill press, sand paper, milk paint, a hammer, rulers, pencils, his hand made awls, and I'm sure I'm forgetting something. Here's a shot of Dan giving us a demonstration. I came away with 4 beautiful books. Two bound with papyrus covers adorn with fossils and two finished off with layered and distressed wood covers and many feet of thread. Dan focuses on the book form itself, and most of his books are collectors items and left blank. For shame! Now here's the real test for me - I'd just love to turn this into my next sketchbook and can't wait to get in there and put these pages to work. But, I must admit the books themselves are so beautiful that they're a bit intimidating to work on! 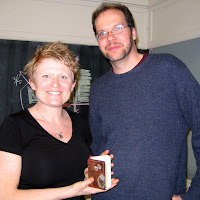 We'll both be teaching at the art and soul mixed media retreat this fall in Portland Oregon. I hope to have my book started by then, I'll let you know in October.